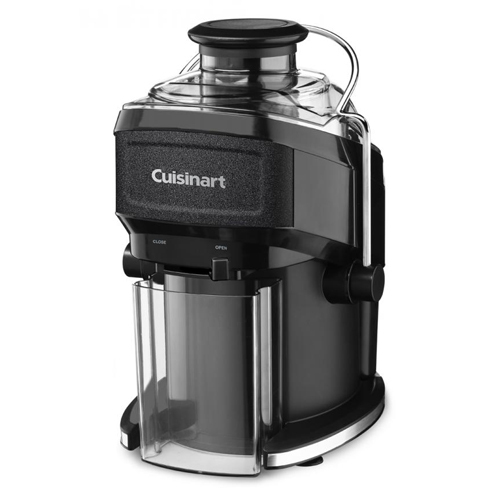 The Cuisinart CJE-500 is a Juice extractor having a adjustable flow spout which is manually controlled and prevents dripping. The food pusher fits securely into the large feed tube to properly guide fruits and veggies and minimize cutting and prepping time, while the mesh filter basket and high-tech blades grind away to extract the maximum amount of juice and separate the pulp. The Compact Juice Extractor has many exciting features for users of all types. You can extend the lifetime of your Compact Juice Extractor with the purchase of a FactoryOutletStore Factory Protection Plan. See the Compact Juice Extractor gallery images above for more product views. The Compact Juice Extractor is sold as a Brand New Unopened Item.